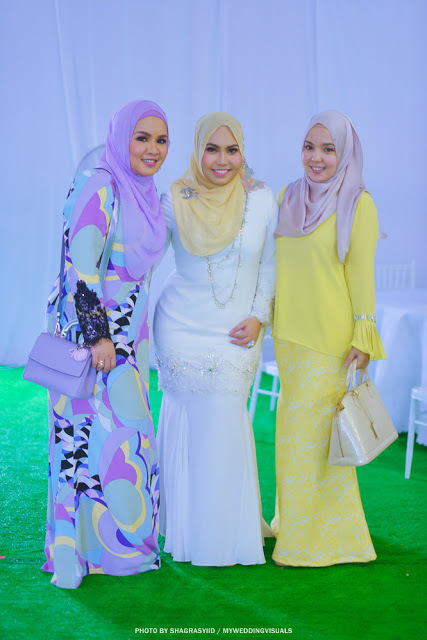 Shazwani Hamid's Blog: Be Your Best Beautiful! For years and years my obsession with beauty and makeup is driven by insecurity. From a very young age, (around 12 years old) I’ve been in a constant state of wanting to look "perfect". Maybe because I was surrounded with negative people.. People who told me I'm ugly. People who told me I should be looking like her. People who said I can't do this and that. People who told me I'm not good enough.. and et cetera. Hence I always wanting to look better. Never feeling good enough with myself. But as I grew older, things changed. Probably because I've been surrounding myself with positive, happy people. I don't really feel the same way I did when I was younger.. I chose to surround myself with phenomenal people who are confident and secure enough to know that there is enough room for all of us to make it to the finish line! And I learned that empowered women never bring each other down. They empower women to do more, to see more and to be more! Sometimes I ask myself - do I want to wear make up because it makes me happy, or because I don’t feel good enough without it? Well..to be honest, I love being all girly and pretty. But I don't wear make up to impress others. I just wear them to make myself happy and feel good. But the truth is, we all have been flogged with the idea that to look beautiful we need to look a certain way... thin/slim, youthful, smooth-skinned, fair-skinned, big-eyed, pointy/small-nosed, silky-haired, etc. As contradictory as it sounds, the individual is slowly becoming the determining factor in cultural standards of being pretty. Blogging has actually enabled me to kinda break the beauty mould in order to have an influential voice. I used to be really insecure with the way I look...But now, I don't really feel the need to be in certain size and shape, I don't need to have the most fair skinned and I certainly don't need to be perfect all the time to have a voice. I just need to be me. We all know that beauty is only skin deep. What's more important is to be kind and be your beautiful self! We all know that skin is the foundation of all the beauty in the beauty industry. Feeling beautiful is powerful. It is vital to your health and well-being. Every woman deserves access to the best skin care possible, be it science, aesthetics and knowledge! 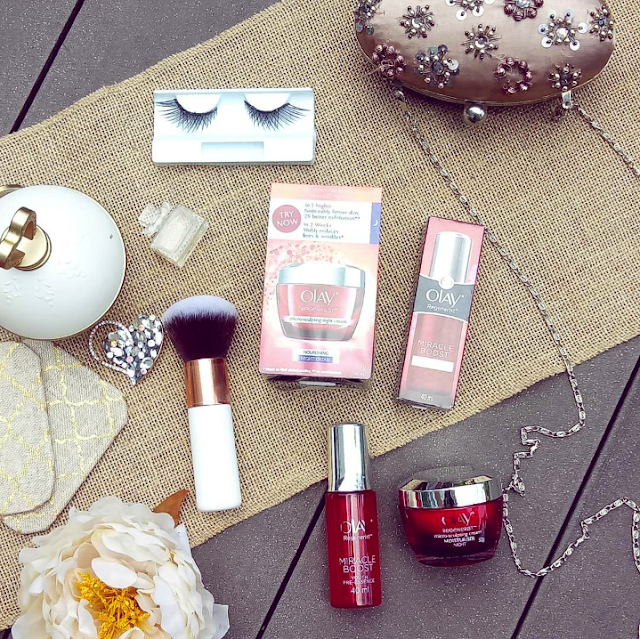 Thus it's important to choose products that actually work for your skin! 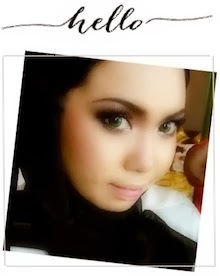 It has been awhile now since I last wrote a review on beauty product.. 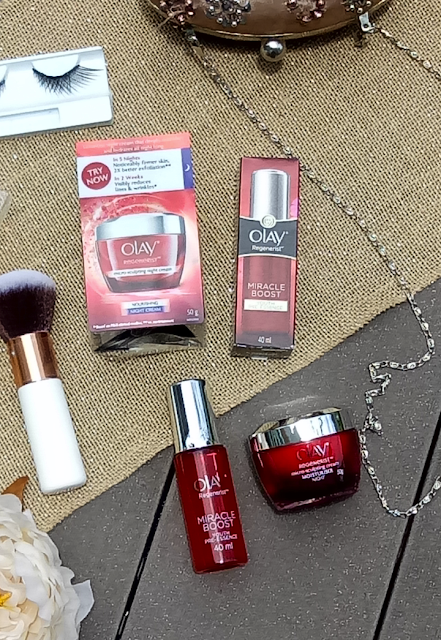 So today, I'll be giving my thoughts on these two products from Olay. I've been using the Olay Regenerist Miracle Boost Youth Pre Essence and Micro-Sculpting Night Cream for awhile now.. These two products are somewhat thin and quite light. They both go on so smoothly on the skin. It’s like patting a silky, liquefied cloud-pudding onto your face. Oh, heavenly! With my combination skin type and the recent deathly-humid weather, I decided to use this duo as a final moisturizing step in my night routine because of its ingredients and, well, it says “Night Cream” on it. Lol. Anyway, I am in LOVE with these products!! 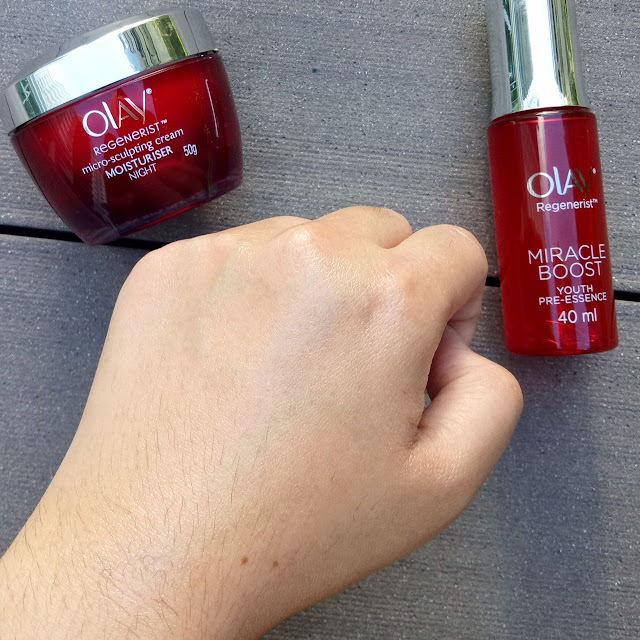 I recently added the Olay Regenerist Miracle Boost Youth Pre Essence to my daily skin routine (day and night) and I'm loving the result I'm seeing, My skin is glowing! 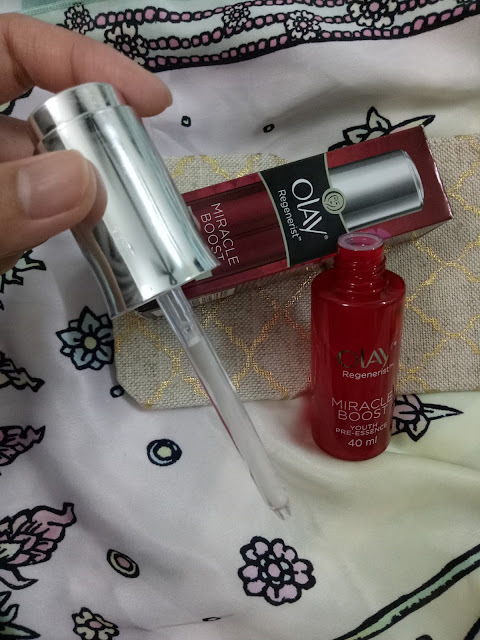 After cleansing the face and using my toner, I apply this Olay Regenerist Miracle Boost Youth Pre Essence before applying my night serum and night cream moisturizer. 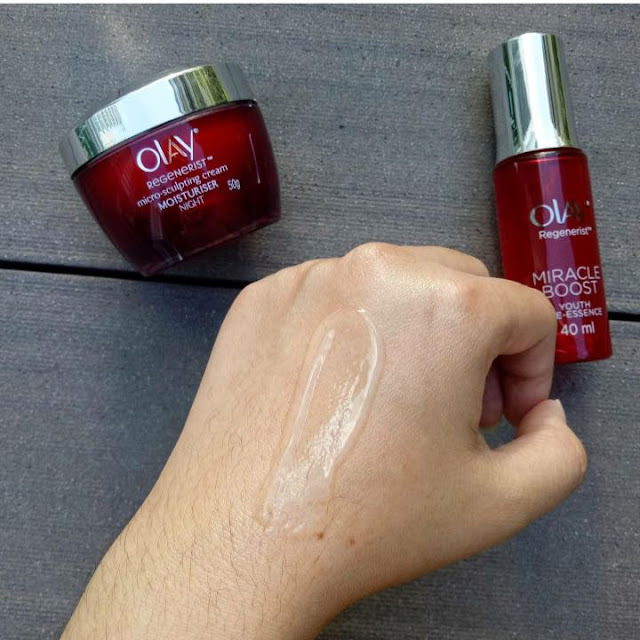 This Olay Regenerist Miracle Boost Youth Pre-Essence is a facial essence designed to be used in conjunction with a daily skin care regimen to help boost skin cell metabolism and renewal. The essence starts the renewal of a million surface cells and helps visibly reduce fine lines, pores and firms the skin. It penetrates quickly, leaving behind hydrated, smooth and supple skin. The bottle dropper is genius, when you open the lid it draws the serum into the dropper providing the perfect amount to cover my face and neck, it is a clear serum with a nice consistency that the product doesn't run everywhere and covers the skin smoothly. It's so easy to dispense the product with a push of the applicator.. The pump makes it very hygienic to use and it dispenses just the right amount of product. Testing on my hands for you to have a clearer visual of them! I find that the fragrance is very subtle too, which is great as it isn't overpowering. My face is looking and feeling so smooth, and bright and I feel like I am glowing when I apply this product! Look at that sheer light texture! It has a runny gel texture that is easily absorbed by the skin. I like how my skin feels moisturized and dewy after I use this pre-essence. The product rapidly penetrates into your skin and the key actives work within the epidermis layer. 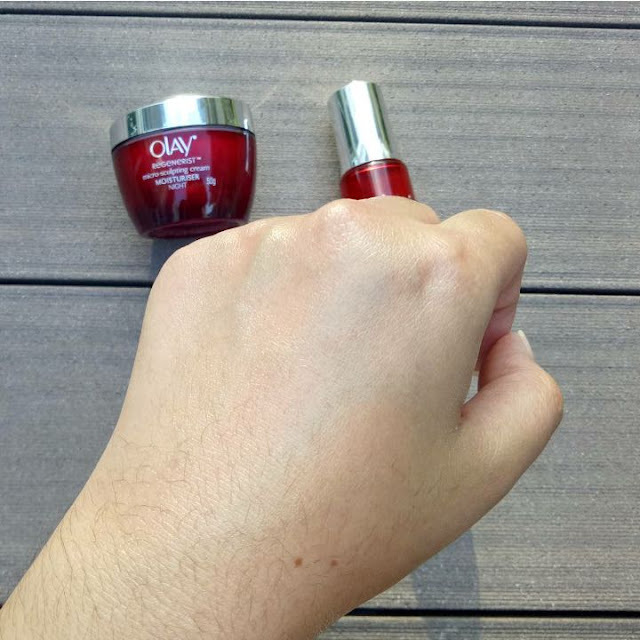 After applying the Olay Regenerist Miracle Boost Youth Pre Essence and my night serum, I apply the Olay Regenerist Micro-Sculpting Night Cream as a final step in my night routine. This cream also has the highest concentration of their signature amino-peptide complex and Hydra-Firming Complex to hydrate all night long. 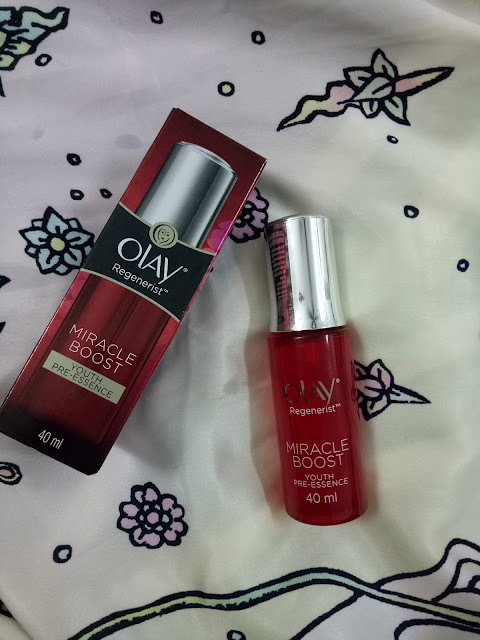 This is perfect to use with the Olay Regenerist Miracle Boost Youth Pre Essence as they both can work together so perfectly. 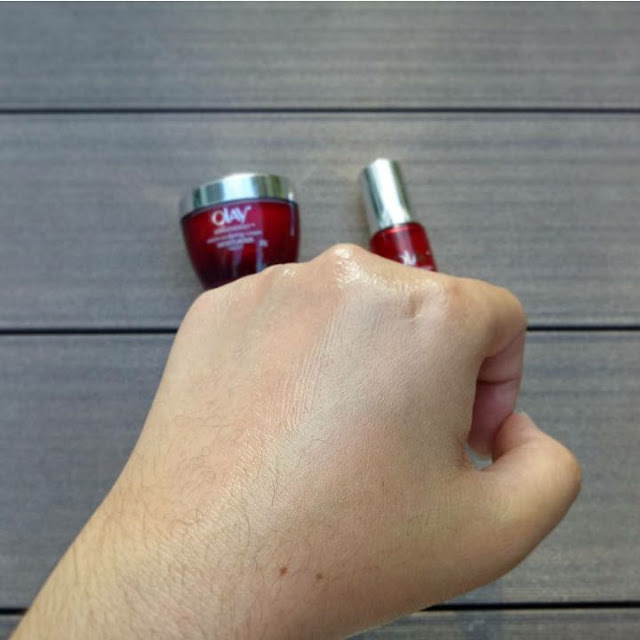 Now let me show you the Olay Regenerist Micro-Sculpting Night Cream. 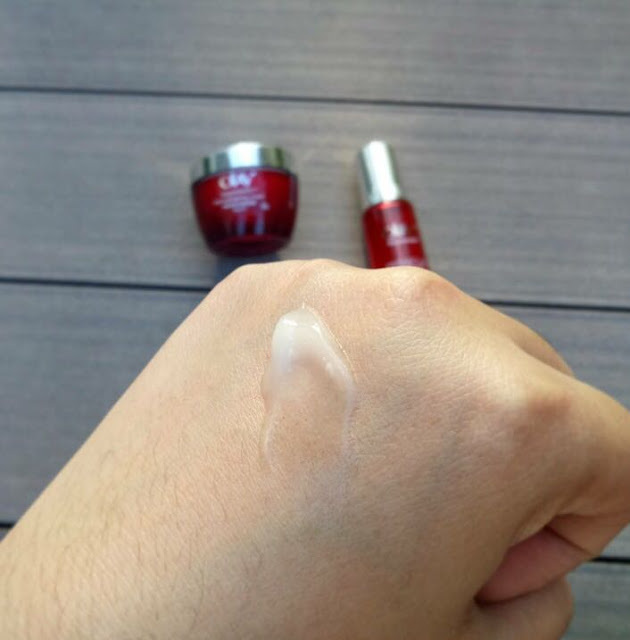 The texture of this night cream is thicker than the pre-essence and it takes a little bit more time to absorb. Some gel products feel sticky though..and I am happy to tell you guys that this product doesn't feel that way at all! This is a luxurious moisturizing and hydrating cream for soft and plump skin. It gives you long lasting moisture with strong hydrating effect and a rich texture to refine rough skin into smooth radiant skin! It absorbs so quickly and hydrates all night long!! 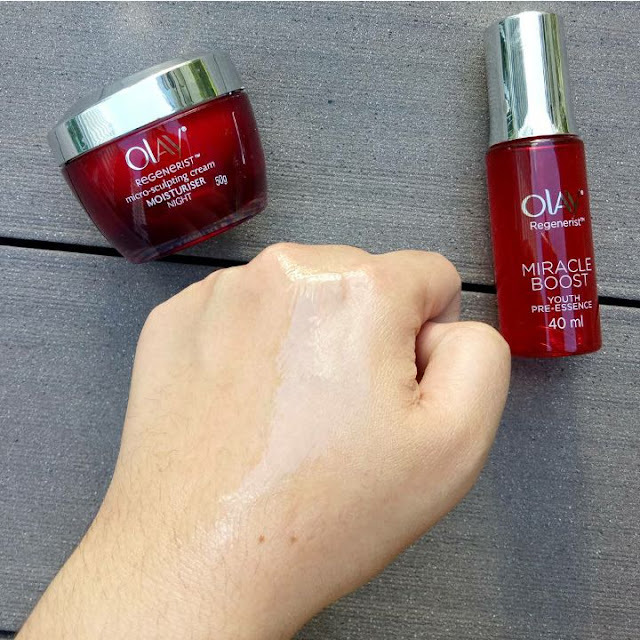 The new Olay Miracle Duo range renews from within, plumping surface cells for a dramatic transformation without the need for fillers. The result is a stunning, youthful skin that is proven to look up to 10 years younger. Let's not settle for less. Let's be the #BestBeautiful you can be!